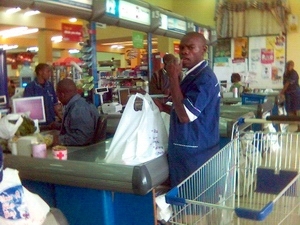 One day in Kenya at the grocery store, I said, “Hello,” to the bag boy. He responded, “Fine”. In Swahili. which is widely spoken in Kenya, you greet someone by saying, “Habari,” which can be translated “How are you?” The response is, “Mzuri,” meaning “I’m fine”. So in the exchange “Hello” – “Fine”, the bag boy was hearing “Hello” with the meaning of “Habari” and responding with the meaning of “Mzuri”. This is called interference. It happens when a person transposes the meanings and structures of his language onto another. Sometimes, the results can be hilarious. When learning French, Dayle tried to say, “I’m full,” translating the sentence word for word into French as “Je (I) suis (am) pleine (full)” which happens to mean “I’m pregnant”. It was stranger when I made the same mistake. We have stories of similar mistakes so embarrassing I can’t write them here. Learning the Cerma (pronounced “CARE – muh”) language in a rural location in Burkina Faso, many years ago, had lots of such moments. People would remember particularly funny things I said while learning Cerma. They would tell them again to everyone when I came around, and the telling would be followed by gales of laughter. One of the helpful by-products of learning another language is a little comic relief for those around us. That is, comic relief for them and embarrassment for us. Language learning requires enough confidence in the Lord and his love, that the hits our egos take do not cause us to give up. Interference can happen in hidden ways.. There are two words for peanuts in French – cacahouettes and arachides. One day in the Congolese town of Isiro, I asked someone to get me some cacahouettes. He went into town and returned much later saying he could not find any. That was impossible. Peanuts are common. 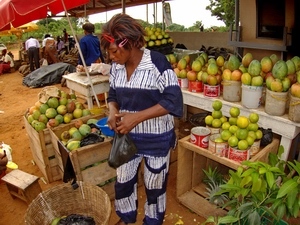 Everyone grows them and they are for sale everywhere, just like the locally-grown fruit at this roadside stand in Ghana. After discussion I figured out that in that area cacahouettes means packaged or canned peanuts. The poor fellow had gone looking for packaged peanuts in what was essentially a ghost town because of the war. It was an impossible mission. He had to go back to buy locally grown, unprocessed arachides and that only took him a few minutes. I have had enough such experiences to wonder how much of any message gets across when it is given in a second language. Even I have to admit that my language mistakes are pretty funny, although sometimes not for ten years . If you enjoyed this, or you want to know more, see our website, subscribe to this blog, talk with us on Facebook, or sign up to support us through prayer or financial support. 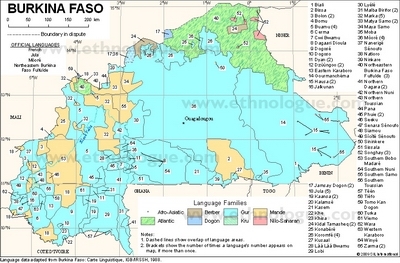 This entry was posted in Africa, Heart language, Language, Linguistics and tagged interference, L2, language learning. Bookmark the permalink. Thanks for a few good laughs! I imagine with language translation of chapters and verses and cultural meanings it can become quite comical sometimes! Keeps the work interesting I’m sure!